West Virginia fence laws require owners to keep any animals they own on their own property. In fencing law terms, West Virginia is a fence-in state. If animals roam beyond their owner's fence line, the owner is liable for any damage they may cause. West Virginia fencing rules are very explicit as to what types of fencing is permissible. West Virginia fencing laws require fences to be a certain height. West Virginia fencing requirements state that most fences should be at least four feet high for both property boundaries and those along public right of ways. 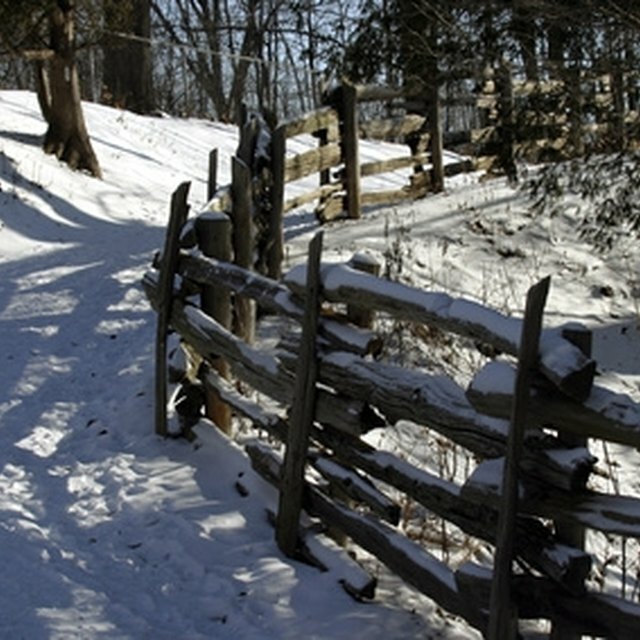 Worm rail fences must be 4 1/2 feet tall, while stone fences need only be 3 1/2 feet tall and 2 feet wide. A hedge fence may be no taller than 4 feet, and the owner must keep any side on public lands trimmed. Wire fences must be 4 feet tall and have six strands of wire. The lowest wire should be 5 inches above the ground, the succeeding wires at 10 inches, 17 inches, 25 inches, 36 inches and 48 inches, respectively. Posts must be no farther apart than 16 feet. High-tensile galvanized wire fences must have eight strands and be at least 46 inches tall. They must be able to bear 200 lbs. of tension Electrified fences must be 38 inches tall and have five strands of high-tensile galvanized wire. Regardless of the type of fence, West Virginia fencing laws require the fence materials to be sturdy enough to corral horses, cattle, swine, goats and mules. Neighbors jointly own fences in West Virginia. While it is possible to not have a boundary fence between the properties, or for one owner to take sole responsibility for ownership and care of a fence, it's best to have that agreement in writing and recorded as part of the property's deed. This avoids any confusion when the property changes hands. When it's time to build a new fence or repair an old one, the landowner wanting to do the building must notify the adjoining neighbor of intent to build. The neighbor then has 10 days to respond. Unless they can agree not to build or repair the fence, both parties are equally responsible for the cost of building or repairing the fence. If the neighbor doesn't pay his share, the builder can take the issue to civil court to receive his share of the building costs.